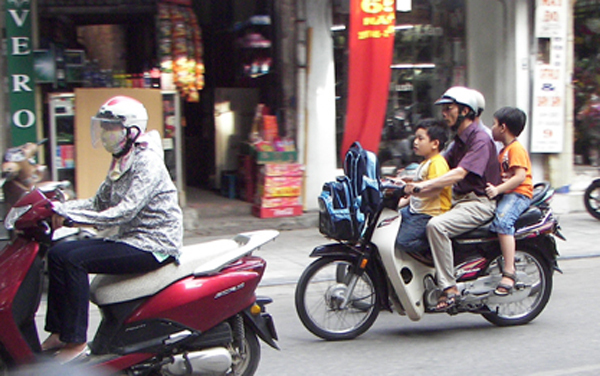 The opportunity to become a motorcycle pillion-passenger in Hanoi offers itself at every street corner. Surprisingly, riding pillion is safe, and the cheapest way to get anywhere within two miles for 30,000 dong (about US$1.90). 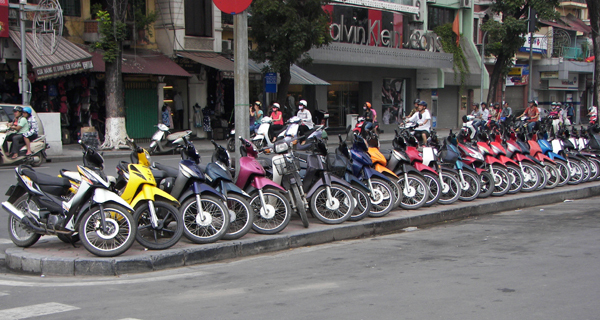 Families in Hanoi don’t own a car — they own a motorbike. Dropping off a child at day-care, collecting a 12-foot ladder for home renovating, and other errands seem to be accomplished with ease by Mom or Dad on the family motorcycle. Apprehensively I watch motorcycles, 12-abreast, waiting at a red light at a very ordinary crossroads. The clock above the lights ticks down from 20 seconds. At three seconds to go, the riders start to surge forward despite the vehicles still crossing from left and right ahead of them. Then follows the skillful slowing, weaving and horn-blowing so typical of Hanoi traffic. But the traffic clears the junction — chaos works! A five-year-old boy steps off the pavement beside you, straight into heavy traffic. Your first impulse is to scream “NO!” and pull him back to safety. But you see that across the road his mother is beckoning to him and smiling. With his eyes fixed on her face he walks slowly and steadily across the road, motorbikes and cars weaving around him. As he reaches his mother he is given a real “proud of you” hug. You then realize that he was simply having one of his final lessons in road safety. A little later you see two girls, ages three and five, holding hands and crossing the road in the same way — confident in their own safety. Yes, there are pedestrian crossings, but they are contemptuously ignored by pedestrians and motorists alike. Indeed, typical of the Vietnamese sense of humor, they are, in many cases, only painted to halfway across the street. As I stood on the pavement in one street, I counted 47 motorcycles pass by me in just one minute. This love affair with mobility starts at about age three, standing up between dad’s (or mom’s) knees and helping to steer the bike through the contortions of the traffic. Incidentally, these motorbikes are ridden with consummate skill by both sexes and in about equal proportion. One motorcyclist told me, “Driving is an art — and we motorcyclists are artists.” Many of these ‘artists’ have little to do but park on busy street-corners — sitting, lying and even sleeping on their bikes while the horn-blowing vehicles move around them. Rickshaw drivers are a different species altogether: they are licensed, unlicensed or pirates. If you really want to become intimate with the radiators of cars and cabs, or check the type of tread on the front wheel of an oncoming motorbike, then the rickshaw is for you. Despite your rising blood pressure, it’s a great way to see some of the sights, especially in the old part of Hanoi. But initially, you must become aware of the way the rickshaw driver works. The sound of a singularly pleasant gong attracts your attention to the rickshaw. This is followed by an “Allo” shouted across the street. Then comes the invitation “One hour?” indicating the usual time for which a rickshaw is hired. If you’ve been shopping and are carrying souvenirs, it is an easy way to get back to your hotel. But before you so much as set a foot on the rickshaw footplate, make sure you’ve agreed on what this one hour will cost. Use a scrap of paper — or your hand or anything else — to write it down, in dong, and get agreement to it before you start. (70,000 dong per hour, US$4.50, is the going rate). Without that tangible agreement 70,000 dong can quickly be said to have been much more. You may find yourself paying whatever they charge if you have not taken this precaution. However, you’ll find that in Hanoi most problems with traffic and rickshaws can be solved, if not entirely avoided, with a big smile, good humor and lots of determination.